Goats eating replacing lawnmowers is not a new concept. But it is a first for Google. We're not jerking your chain here or even trying to make you to be the goat. And April Fool's was so last month. But word leaked on Friday that Google is hiring. For real. But they are not hiring our kind. Out of sheer love for the world it tries to run, or maybe just good pr, Google announced on its blog Friday that it has ditched lawnmowers and hired goats to keep its lush lawns groomed. "At our Mountain View headquarters, we have some fields that we need to mow occasionally to clear weeds and brush to reduce fire hazard," Dan Hoffman, Google's director real estate and workplace services, posted on the company blog . 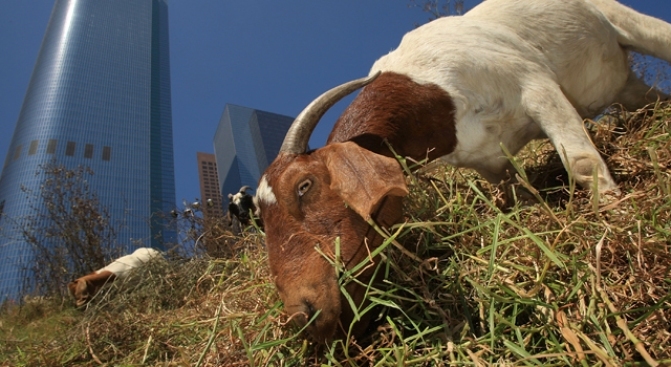 "This spring we decided to take a low-carbon approach: Instead of using noisy mowers that run on gasoline and pollute the air, we've rented some goats from California Grazing to do the job for us (we're not 'kidding')." The Silicon Valley giant will herd in 200 of the industry's most impressive goats, we're sure, and let them roam the lawns for a week, eating all the grass they can digest. "It costs us about the same as mowing, and goats are a lot cuter to watch than lawn mowers," Hoffman said. Our friends at Tech Crunch asked PETA for a comment. After laughing they said they would get back to him with official word by Friday night. No word on whether the goats will get paid extra to fertilize the lawns while they're at it.